In Christchurch's Cathedral Square a wall of colourful peace flags flail in the breeze. Another testament to the lives lost in the earthquake. C1 café is as eco-friendly as it is offbeat, using heat produced by the kitchen and coffee roasters to generate all its power. If that’s not a big enough feat, the café’s innovative design also features a network of pneumatic tubes suspended above its customers, delivering sliders to tables direct from the kitchen. 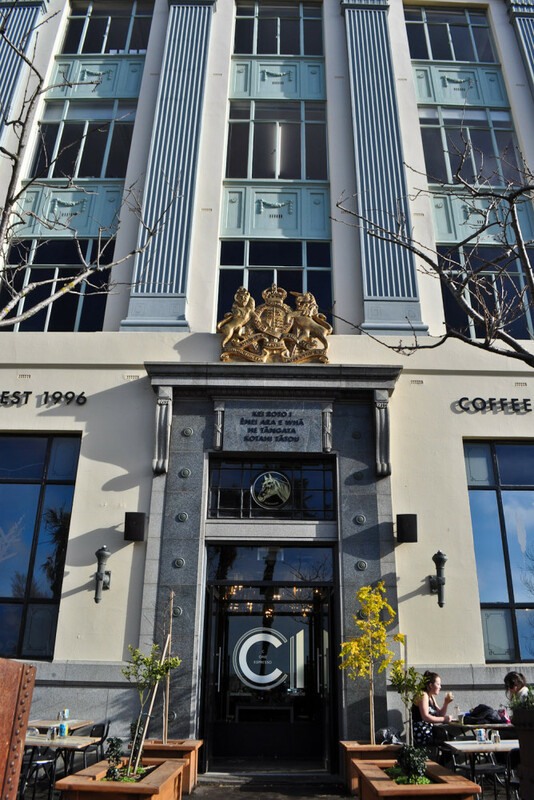 Once Christchurch's post office, this sturdy heritage building now houses C1 Espresso Bar. 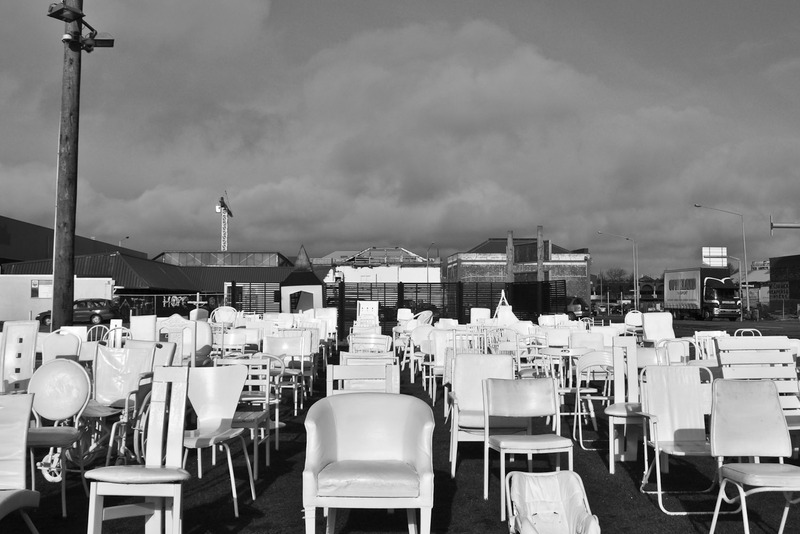 Across the road from where the six-storey CTV building once stood (where over half of the fatalities from the Christchurch earthquake occurred), 185 white chairs are lined up on an empty street corner to mark the number of lives lost in the disaster. It’s a haunting reminder of how the earthquake impacted this community, far beyond broken buildings. Splashes of vibrant street art are interspersed between demolition sites that dominate the landscape, quirky art installations fill empty blocks of land, while bars and restaurants harness this ‘new Christchurch’ feel. 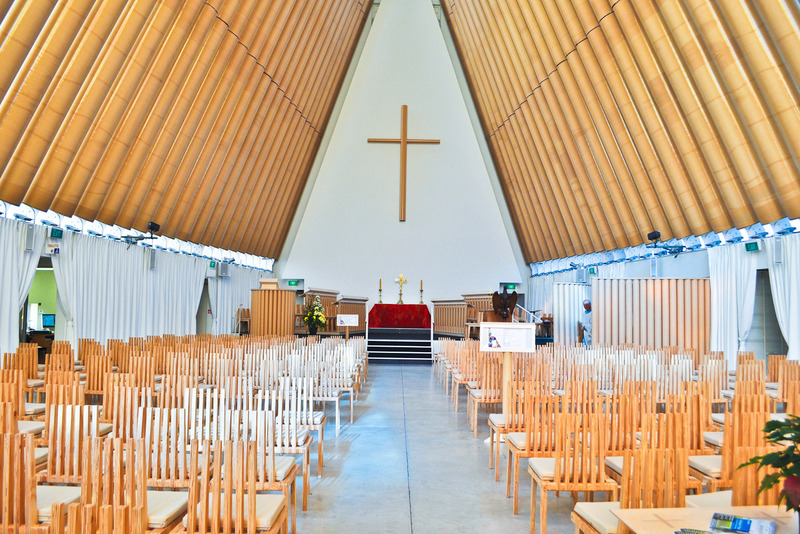 Replacing the iconic Christchurch Cathedral is the transitional ‘Cardboard Cathedral’, designed by 2014 Pritzker Architecture Prize winner Shigeru Ban. Inside the unconventional Cardboard Cathedral you can see the masterpiece of cardboard tubes, shipping containers and coloured glass. It’s a sign of the times in Christchurch, of the shift towards the modern and the artistic. 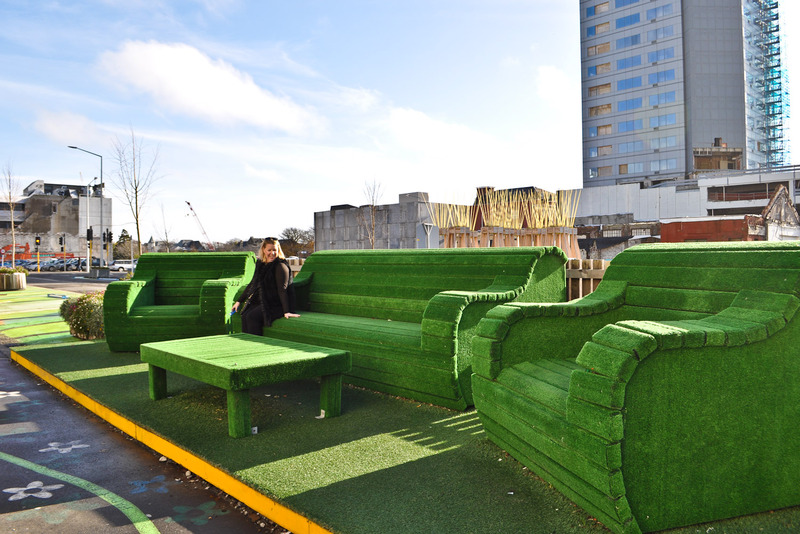 ‘Gap-filler projects’ like this faux-grass lounge set have popped up across Christchurch to bring life back to now vacant spaces. 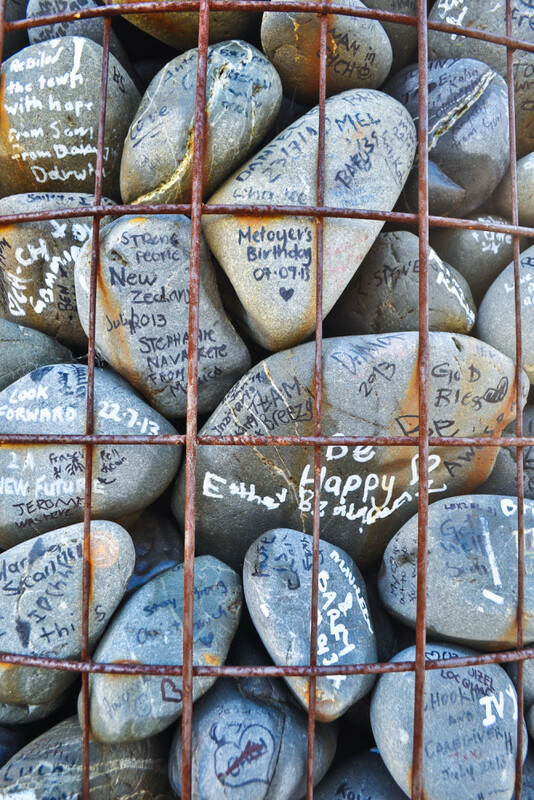 In Cathedral Square stands a tower of stones covered in handwritten messages like “Stay strong New Zealand”, which was put in place to show support for the local community after the earthquake. In keeping with Christchurch’s resourceful response to the quake is Rekindle, a team of clever craftsmen turning rubble and waste into stylish furniture, sculpture and jewellery. Visit their local shopfront on New Regent Street, where you can pick up a striking wall hanging, a set of timber off-cut bangles or sweet children’s building blocks. Three years since Christchurch was ripped apart by a devastating earthquake, out of the rubble and heartache has emerged a designer city that’s moving from strength to strength. Words and photography by Alissa Jenkins. “If you ask me, Christchurch was broken before the earthquake,” says 37-year-old Sam Crofskey. Swirling a morning ristretto in hand at his espresso bar C1 (one of the city’s most-loved establishments and New Zealand’s largest café), Crofskey reflects on his hometown since 22 February 2011 – a date etched in the hearts and minds of every New Zealander. It’s the silver lining to a devastating situation. Eighty per cent of Christchurch’s buildings were demolished post-quake, but it has provided locals with a clean slate of sorts; an opportunity to create the city they want to live in. A city with colour, with creativity, with a sense of fun. Having been in Christchurch less than 12 hours, I can already see the shift. Splashes of vibrant street art are interspersed between demolition sites that dominate the landscape, quirky art installations fill empty blocks of land, while bars and restaurants harness this ‘new Christchurch’ feel. Housed in the city’s former post office on High Street, C1 (like most new establishments) has been largely decked out in bits and bobs salvaged from the rubble. Here tables are made out of old timber floors, the counter is a resourceful masterpiece of Lego blocks, while a prized pinball machine remains one of the few items that survived the collapse of C1’s previous site. “Like most people here, we just had to rebuild with what we had,” says Crofskey. In a bid to be as self-sufficient as possible, the café’s front garden boasts an array of vegetables to supplement the menu, while vines for wine and beehives for honey can be found on the rooftop. As eco-friendly as it is offbeat, C1 also uses heat produced by the kitchen and coffee roasters to generate all its power. 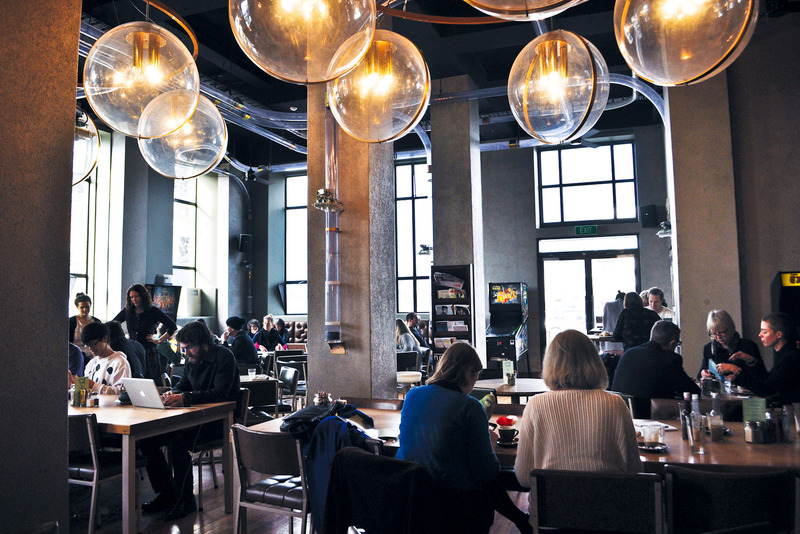 If that’s not a big enough feat, the café’s innovative design also features a network of pneumatic tubes suspended above its customers, delivering sliders to tables direct from the kitchen. And you’ll soon be able to experience C1 overnight with a boutique hotel due to open upstairs in early 2015. Over in the city centre, the earthquake commissioner Gerry Brownlee is in town today. Followed by a flurry of camera crews and notepad-clutching journos, he’s here to mark the next phase of construction at Christchurch’s new shopping precinct, Re:START. It’s a fitting name: amid the city’s tireless efforts to, well, restart, these shops have replaced what was once Cashel Street Mall, the Christchurch equivalent of Sydney’s Pitt Street Mall or Melbourne’s Bourke Street Mall. Initially set up inside a collection of shipping containers due to the limited resources post-quake, the makeshift shops were so popular they’ve since become permanent fixtures in the city’s landscape. Today this colourful cluster is home to cafés and banks, to specialty retailers and New Zealand-centric boutiques. For the next 12 months you’ll also find the ‘Future Christchurch Showcase’ here – a container dedicated to a large-scale interactive map of the city, highlighting the rebuild progress. And what progress there is. The air throughout the city rings with what locals have dubbed the ‘Christchurch Choir’ after the hordes of construction workers who perform daily with their band of thudding jackhammers, screeching grinders and roaring chainsaws. It would be remiss to talk progress here without making mention of the city’s centrepiece, the Christchurch Cathedral. Having been irreparably damaged in the earthquake, the iconic 19th-century landmark has remained untouched as debate continues over its demolition. But in the background of the bickering has emerged a distinctly modern replacement – the transitional ‘Cardboard Cathedral’, designed by 2014 Pritzker Architecture Prize winner Shigeru Ban. 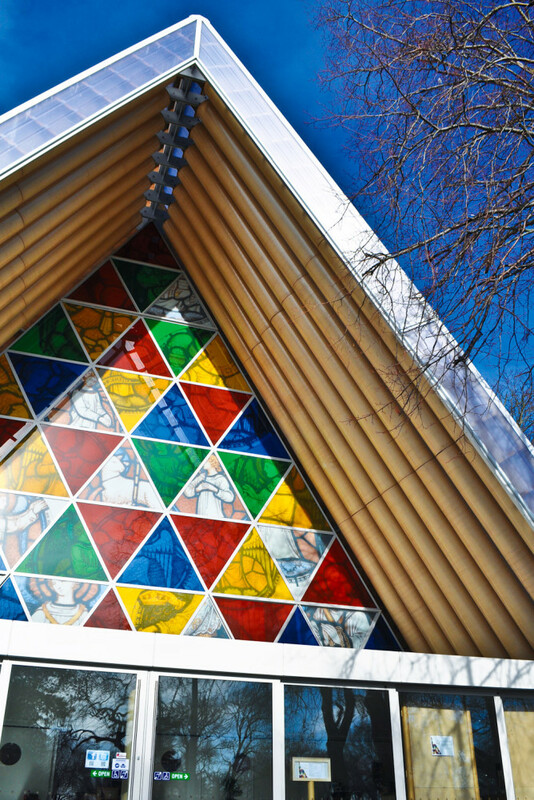 An unconventional masterpiece of cardboard tubes, shipping containers and coloured glass, it’s a sign of the times in Christchurch, of the shift towards the modern and the artistic. Of course, ‘Christchurch 2.0’ isn’t all shiny new shops and cafés. There’s no denying the overwhelming loss experienced here. And in new-Christchurch fashion, you can see artistic testaments to this throughout the city. Across the road from where the six-storey CTV building once stood (where over half of the fatalities from the earthquake occurred), 185 white chairs are lined up on an empty street corner to mark the number of lives lost in the disaster. It’s a haunting reminder of how the earthquake impacted this community, far beyond broken buildings. 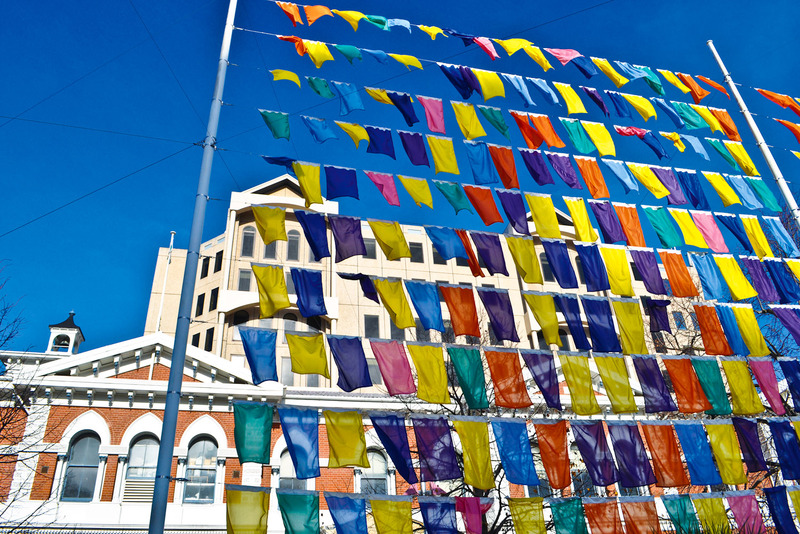 Similarly, in Cathedral Square a wall of colourful peace flags flail in the breeze, while nearby stands a tower of stones covered in handwritten messages like “Stay strong New Zealand”. ‘Gap-filler projects’ like these have popped up across Christchurch to bring life back to now vacant spaces. One of the more popular initiatives is the ‘Think Differently Book Exchange’, housed inside a recycled fridge on Barbadoes Street. Accessible 24/7, this public exchange shares books that people have found in some way life-changing, proving a popular stop-off for locals and visitors alike. Much more upbeat is the ‘Dance-O-Mat’, filling a barren block with its random dancefloor, ex-laundromat washing machine and overhead disco ball. Anyone can plug their iPod or smartphone into the converted washing machine, insert a $2 coin to activate the speakers, and voila, alfresco dancefloor! There’s no shortage of these ingenious concepts colouring the region either, especially with a local think tank dubbed the ‘Ministry of Awesome’ dedicated to helping locals turn creative community ideas into a reality. Although it’s predicted it will take another five years for the city to be completely repaired, this is one incredible place to see in transition. Sure, Christchurch needed a shake up, but not to the extent of a magnitude 6.3 earthquake. And in spite of the ensuing devastation and heartache, it has emerged a glass-half-full kind of city that’s well and truly on the mend; a city that’s far from broken. At first glance, Christchurch nightlife may seem rather subdued as party-goers are rarely seen out and about due to bars being located so far apart. An intimate whiskey and cocktail lounge with a speakeasy feel in historic New Regent Street, The Last Word lays claim to a carefully curated menu of tipples to tickle your fancy. Happily, every order comes with a handwritten note naming your poison, just in case you indulge in one too many and can’t remember in the morning. Once home to a burgeoning tanning industry at the end of the 19th century, the original frame now houses the Tannery Boutique Retail and Arts Emporium with some 60 boutiques, impressive restaurants and CBD Bar. A great family-friendly option, this rustic gastro-pub is a laidback marriage of local craft beer (as well as a lengthy list of brews made elsewhere), live music, deli café and a wood-fired pizza restaurant. In keeping with Christchurch’s resourceful response to the quake is Rekindle, a team of clever craftsmen turning rubble and waste into stylish furniture, sculpture and jewellery. 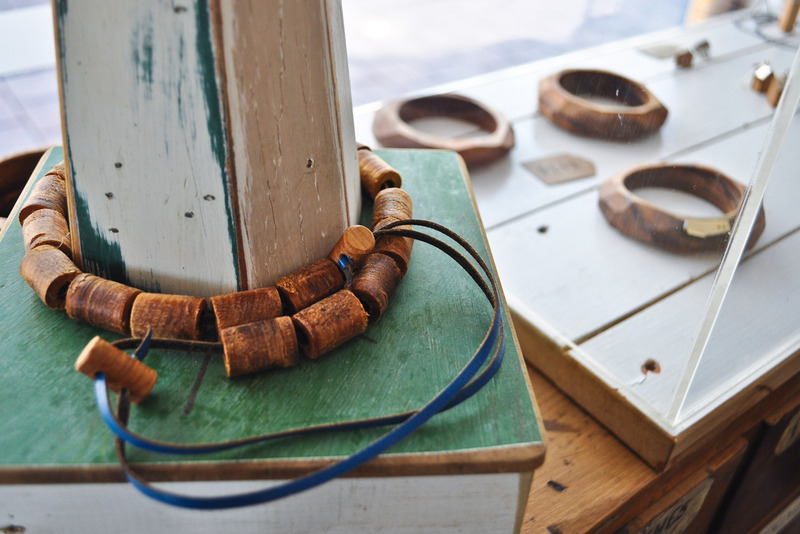 Visit their local shopfront on New Regent Street, where you can pick up a striking wall hanging, a set of timber off-cut bangles or sweet children’s building blocks.